You may think of Snake Road as the ridge road that climbs the crest between Thornhill and Shepherd canyons, but it’s really Colton Boulevard. 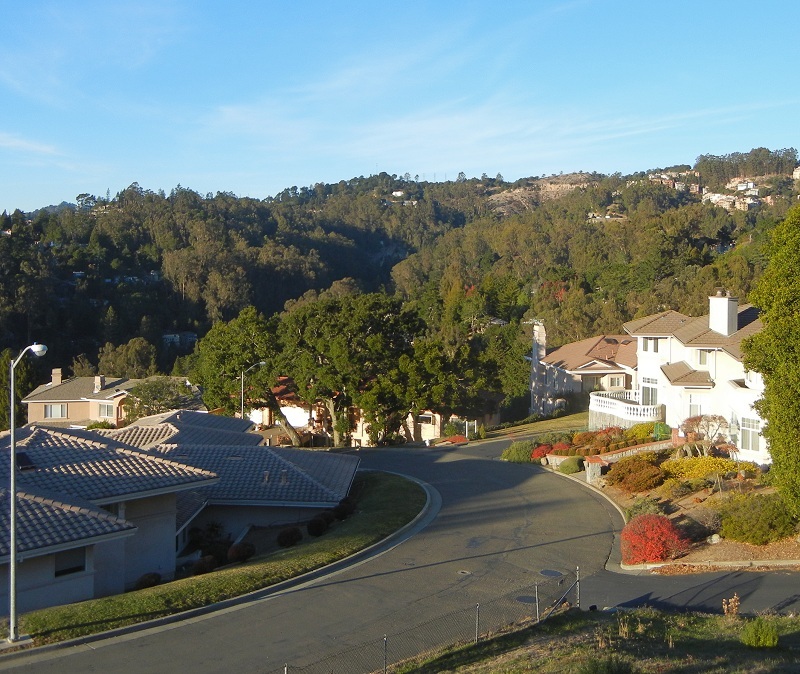 For a quiet hike above Montclair with views, you want Colton. Its lower part runs north of Snake across ground underlain by the Redwood Canyon Formation. 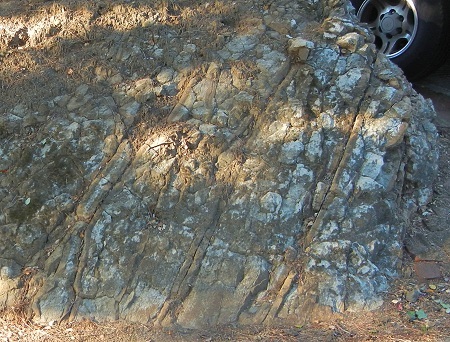 Here’s a roadside outcrop. I didn’t even notice the parallel fractures until I opened the photo at home. They probably represent a bit of extra cementation, thanks to a late pulse of fluids, but they may also be original bedding. I mentioned views. If you loop around Mendoza and Mazuela Drives you can view some immaculate houses and grounds, but I like the big empty lot on Mazuela that overlooks Pinehaven canyon; click it for the bigger version. This entry was posted on 31 January 2014 at 9:01 pm and is filed under Oakland geology views, Oakland rocks. You can follow any responses to this entry through the RSS 2.0 feed. You can skip to the end and leave a response. Pinging is currently not allowed. I grew up on Thornhill near the school (where my parents still live), and I remember in the early- to mid-1990s, the Mazuela housing development stalled out, leaving nothing but empty lots, streets, and drainage gutters for several years. Lots of fun for an 11-year-old on a bike. Would have been a great drinking/makeout spot for me in high school, but I wasn’t nearly that cool. Thanks for sharing the fire photos, Mary. It was a traumatizing experience for a kid on Thornhill! I have a distinct memory of my dad on the roof with a hose just like the guy in your photo. 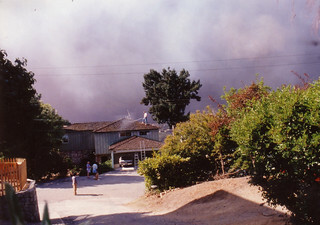 I now live on Mountain near Broadway Terrace (my grandmother was living there in 1991), and by some miracle the house didn’t burn. It’s about a 30-second walk from my front door to whole neighborhoods that were wiped out.